After more than two centuries of willful collective ignorance about Jefferson and Hemings, it might sound far-fetched to suggest that she ought to be designated a first lady. But our country was populated through precisely this sort of racial mixing - sexual relationships that, it bears repeating, enslaved people such as Hemings did not choose for themselves. Evelia Jones, "It's time to recognize Sally Hemings as a first lady of the United States," The Los Angeles Times, January 4, 2019. https://www.latimes.com/opinion/op-ed/la-oe-jones-sally-hemings-first-lady-20190104-story.html. 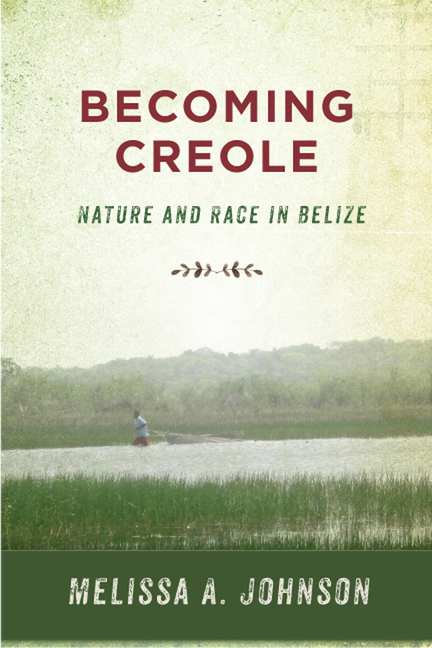 Becoming Creole explores how people become who they are through their relationships with the natural world, and it shows how those relationships are also always embedded in processes of racialization that create blackness, brownness, and whiteness. Taking the reader into the lived experience of Afro-Caribbean people who call the watery lowlands of Belize home, Melissa A. Johnson traces Belizean Creole peoples’ relationships with the plants, animals, water, and soils around them, and analyzes how these relationships intersect with transnational racial assemblages. She provides a sustained analysis of how processes of racialization are always present in the entanglements between people and the non-human worlds in which they live. Appendix/Glossary: Belizean Kriol Words and the More than Human? ?